Endeavour has docked with the International Space Station (ISS) on Flight Day 3, following a stunning RPM (Rbar Pitch Maneuver) – allowing engineers on the ground to make extensive evaluations into the orbiter’s Thermal Protection System (TPS). So far, engineers expect to see only minor cosmetic damage on Endeavour’s heatshield, following several debris events during her ride uphill on Wednesday. Endeavour docked with the ISS’s PMA-2 (Pressurized Mating Adapter) on the Harmony module, marking the start of a busy five EVA docked phase for STS-127. Endeavour herself continues to perform well, with no technical issues of note listed by the Mission Evaluation Room (MER) – a list that includes the completed replacement of a Microbial Filter by the crew following a leakage, and similarly a Galley H2O Transfer Hose leak that was ably controlled. All other items on the list are also minor, such as “during Post Insertion the crew reported that all of the circuit breakers on panel ML86B, Row F were open,” as reported by the MER. Flight Controllers in Houston are also continuing to monitor whether a COMBO (Computation of Misses Between Orbits) related reboost will be required. Those evaluations will be completed later on FD3. “We are currently tracking a conjunction with Object 84180,” added the publicly released execute package. “The Time of Closest Approach (TCA) is around 2/11:08. We have planned a Config 3 reboost at 2/02:27 to avoid this object if necessary. That reboost – using Endeavour’s venier thrusters to raise the ISS/Shuttle stack by 0.8m per second over 15 minutes – was later confirmed and was carried out at 7:30pm Central. The main interest continues to focus on evaluations into the health of Endeavour’s TPS – as is the case with all missions. Aiding the evaluations will be the visually beautiful back flip that the orbiter was commanded through, around one hour ahead of docking. The nine minute maneuver – which involves the orbiter being commanded through a 360 degree back-flip – was debuted on STS-114’s Return To Flight mission, following months of planning by shuttle experts at the Johnson Space Center (JSC). They were tasked with the limitations on crew and sensor visibility, maneuvers conducted about an unstable orbital station keeping position, inherently unstable attitude dynamics, thruster plume impingement on the ISS, shuttle propellant limitations, and a very tight set of lighting and geometry constraints for the inspection photography. That photography will be downloaded to engineers on the ground, who will carry out what is now a well rehearsed exercise of checking through all areas of Endeavour’s TPS for any areas of concern. The data will be added to Flight Day 2’s OBSS (Orbiter Boom Sensor System) surveys, along with the already acquired ascent imagery and radar data. Flight Day 2 photography of Endeavour’s two OMS Pods – set of hi res images available on L2 – is also undergoing evaluation, with no concerned noted at present. 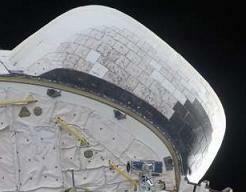 Previous missions have shown blankets attached to the associated tiles on the pods can have a tendency to come loose and protrude, although new stitching procedures appear to have mitigated the issue, with no problems observed for a number of recent missions, including STS-127. “SRB Retrival Status: SRB recovery is going well. Liberty Star with the RH SRB is expected at the dock tomorrow at 0800 EDT and Freedom Star will follow with LH SRB at 1000 EDT,” noted Friday processing information (L2). The importance of checking the orbiter’s TPS is obvious, although there is slightly more interest in Endeavour’s ascent due to dramatic footage of ET-131’s foam liberating at several intervals during ascent. The main area of foam loss was observed from the intertank ribs on the tank, and while the liberation was very late in ascent – and thus unlikely to be a TPS damage concern – evaluations are already taking place on ET-132 (set to fly with Discovery next month) and downstream tanks at the Michoud Assembly Facility (MAF) in New Orleans. “ET-132 / BI-139/ RSRM 107 (VAB HB-1) C and E Platforms are retracted. B and D platforms are on hold at this time pending the need to perform assessment of the Intertank area on ET-132,” noted STS-128 processing information on L2. The assessments will involve pull tests on the intertank foam, and potentially X-Rays, as engineers check the adhesive properties between the foam and the tank’s structure – which is currently a leading candidate for the liberations during Endeavour’s ascent. 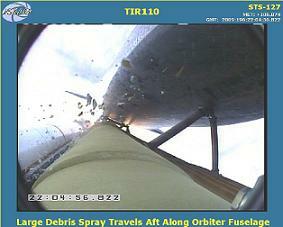 However, several other foam liberation events were noted at various stages of STS-127’s ride uphill, with the DAT (Damage Assessment Team) mainly focusing on the two events around T+106, where “showers” of debris could be seen passing by the External Tank camera, before some of the debris impacted the orbiter on the right hand Chine area. The event was similar to STS-125’s Chine damage, although engineers believe Endeavour has suffered even less “cosmetic-level” damage. As noted by Shuttle Manager John Shannon, the footage was more dramatic as the foam liberated from near the ET camera, before hitting the tank’s feedline, breaking up and passing in front of the camera’s immediate field of view. Also aiding evaluations is date from the WLE IDS (Wing Leading Edge Impact Detection System) – a suite of sensors embedded into the leading edges of the orbiter’s wings, used to “feel” for any impacts on the critical flight surfaces. Seven indications were ‘felt’ by the sensors on the starboard (right hand) side of the orbiter during ascent, which are likely to relate to the foam liberation events at around T+106 seconds. However, the indications – rated by Grms ratios – are all low, thus no damage is likely to have occurred. It is understood that readings of 10 to 20 Grms and above would become a concern for engineers on the ground. According to the WLE IDS presentation, RCC Panel 9R suffered the largest indication of 3.3 Grms. “All WLE IDS ascent summary data was downloaded and down linked successfully. Seventeen (17) half second windows of detailed G time histories were downloaded in order to confirm the implication of cases above 1 Grms. 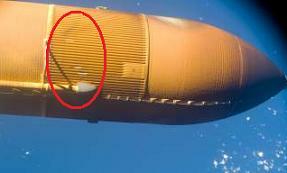 In total, there are ten (10) probable indications,” noted the WLE IDS presentation into Endeavour’s ascent. “Seven (7) probable indications occurred on the starboard RCC and one (1) probable indication occurred on the port RCC. Two (2) probable indications occurred on the starboard chine. Damage Risk categories for the indications range from Category 1 – Category 4. The system will continue its work on orbit, checking for any impact indications from MMOD. Further indications are not unusual, given the sensitivity of the system. 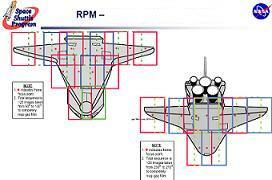 The DAT engineers also made a reference to the Nose Landing Gear Door (NLGD) as an area they will be taking a closer look at, once the RPM imagery has been downlinked to the Johnson Space Center (JSC). 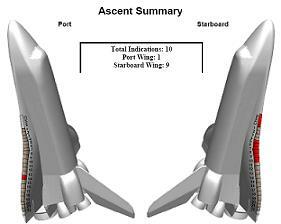 “Debris detected near NLGD at around 377 seconds (into ascent). Forward edge imaged during nose cap scan on FD2. Mid area and aft visible in ascent imagery. Nominal FD2 nose scan is not conducive to imaging fwd NLGD area.” However, a debris event at such a late stage of ascent is highly unlikely to have resulted in serious damage. Chips to tiles around the Main and Nose Landing Gear Doors has been seen on numerous missions in the past – all of which have been cleared for re-entry. Further updates will follow. For live, up-to-the-second updates, refer to the live update pages linked above.